For a swimming pool owner, there are few water conditions more dreaded than an algae outbreak in her pool. Algae are microscopic plants that thrive in sunlight and water, which swimming pools contain in great abundance. Fortunately, swimming pool algae can be eradicated through the application of algaecides, for one. But there are different types of algaecides, with each containing different types of anti-algae chemicals or minerals. Also, some pool algaecides are meant more for preventative purposes than for eradication purposes. If used properly, swimming pool algaecides will quickly eliminate a pool algae contamination. Swimming pool algaecides fall into three separate classes: quats (quaternary), polyquats and mineral-based coppers and silvers. Which algaecide you employ against a pool algae contamination depends on what you want out of the algaecide itself. Quat algaecides tend to foam water up, but they're inexpensive. Polyquat algaecides are very effective, but they're relatively expensive. Mineral-based algaecides attach to pool surfaces to prevent algae from taking up residence, but they'll stain those surfaces if not properly applied. Quaternary, or quat, pool algaecides contain what are called quaternary ammonium chloride salts at 5 to 10 percent concentrations. The ammonium compounds in quat algaecides act as surfactants in a swimming pool's water. Algaecide ammonium compound surfactants in water lower the water's surface tension, which splits open algae cell walls and kills them. Besides quaternary ammonium chloride, other ingredients of quat algaecides mainly include water and other inert substances. Quat algaecides are employed more as preventatives rather than active algae killers. Polyquat ("polyquats") algaecides are very effective at killing most types of pool algae contamination, including green, chlorine-resistant mustard and even black algae. Polyquat algaecides are nonfoaming in nature. Like their quat algaecide cousins, polyquats contain ammonium chloride salts but at 30 to 60 percent concentrations. Polyquats don't foam up because of the specific way in which their ammonium chloride ingredients are formulated. Outside of high ammonium chloride concentrations, the remaining ingredients in polyquat algaecides include water and other inert (chemically inactive) substances. Mineral-based pool algaecides work well as both preventatives and as active algae-destroying products. The two major mineral-based pool algaecides are those containing either copper sulfates or colloidal silver. Both types of mineral algaecides work by creating residuals on pool walls where algae like to take up residence. Copper sulfates and colloidal silver are toxic to algae and will kill them off quickly if algae comes into contact with them. Colloidal silver algaecide is also bacteria-killing and often reduces pool chlorine needs. Apply any type of swimming pool algaecide only according to direction. 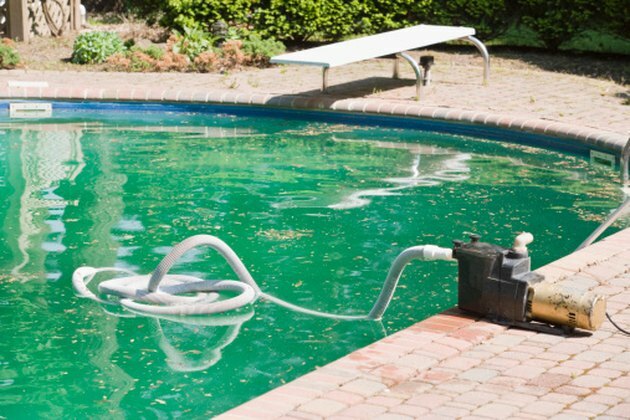 If you add too much quat algaecide to a swimming pool, water foaming will occur. The best method for destroying swimming pool algae is to superchlorinate the pool's water and follow up with an algaecide. The best preventative of all against pool algae is to maintain proper swimming pool water chemistry. Pool chlorine should be at 1 to 3 parts per million (ppm) and pH at 7.4. to 7.6. What Are Some Home Remedies for Phosphate Removal From Swimming Pools?